Source devices include laptop smartphone, tablet, camera, etc. Display devices include monitors, TVs, projectors, etc. 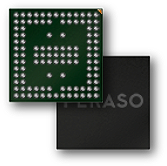 Peraso’s consumer products are among the first to achieve the Wi-Fi Alliance’s new WiGig CERTIFIED™ designation. The multi-gigabit speed of WiGig 60 GHz chips allow us to completely rethink technologies still tethered to wires, such as virtual reality, media streaming, wireless back-up and video monitoring.